Graduates of the Phoenix Raven Qualification Course pose for a class photo with their instructors and leadership Feb. 12 on Ramstein Air Base. U.S. Air Forces in Europe, Air Forces Africa and 86th Airlift Wing leadership requested a mobile training team to come and direct the Raven course at Ramstein. The Airmen completed approximately three weeks of rigorous training to join the Air Force’s Raven program. The program focuses on the concept of specially-trained security forces Airmen who travel with and protect Air Force aircraft around the world. The Raven students came from the 86th Security Forces Squadron, 435th Security Forces Squadro and 569th U.S. Forces Police Squadron. This particular class is unique because instead of taking place at the Raven program’s hub at Joint Base McGuire-Dix-Lakehurst, New Jersey, it took place at Ramstein. U.S. Air Forces in Europe and Air Forces Africa and 86th Airlift Wing leadership requested a mobile training team to come from JB MDL and conduct the course here. Master Sgt. Sean Cunningham, 421st Combat Training Squadron Phoenix Raven Qualification Course director, oversaw the class and served as the master of ceremonies for the graduation. He commended the graduates for their perseverance throughout the course. The Air Mobility Command Phoenix Raven Qualification Course involves daily physical training sessions, Armament Systems and Procedures Baton training, use-of-force scenarios, combatives and live-fire training. The course also includes 15 academic classes, which cover topics such as airfield assistance and embassy operations. Master Sgt. 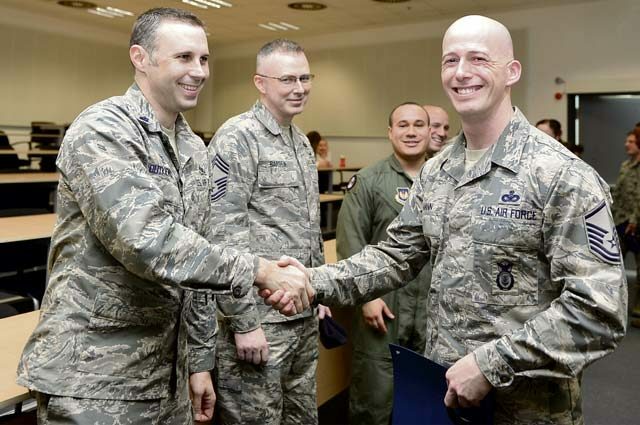 Edward Mann IV, 86th Security Forces Squadron flight chief, left, shakes hands after his graduation from the Phoenix Raven Qualification Course Feb. 12 on Ramstein Air Base. A mobile training team came from Joint Base McGuire-Dix-Lakehurst, New Jersey, to conduct the course within U.S. Air Forces in Europe and Air Forces Africa. 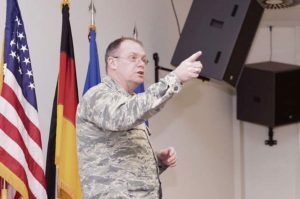 The cadre who led the course at Ramstein described Raven training as the most intense training in the Air Force security forces world. Brig. Gen. Richard G. Moore Jr., 86th AW commander, congratulated the new Ravens and handed them their graduation certificates. The graduates also received the Raven tab, which they can now wear on their uniforms, and a coin with their Raven number on it. Only a small portion of security forces Airmen have the opportunity join the Raven corps. Moore encouraged the graduates to take pride in their accomplishment and use their new found skills wherever they find themselves later on in their careers. Master Sgt. Edward Mann IV, 86th Security Forces Squadron flight chief, one of the graduates in this class, expressed gratefulness for becoming a Raven and looked forward to more opportunities in his career. Mann acknowledged that the training was very difficult and that a student needed not only physical strength but mental strength as well. He said he is proud not just of himself, but his classmates as well. Knowing that there are trained Airmen standing guard all the time gives us all peace of mind, Moore said. Brig. Gen. Richard G. Moore Jr., 86th Airlift Wing Commander, gives a speech during a Phoenix Raven graduation ceremony Feb. 12 on Ramstein Air Base. Although Air Mobility Command owns the Raven program, a mobile training team came to Ramstein to conduct the Phoenix Raven Qualification Course upon the request of U.S. Air Forces in Europe and Air Forces Africa leadership.